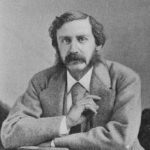 Bret Harte was an American short story writer and poet, best remembered for his short fiction featuring miners, gamblers, and other romantic figures of the California Gold Rush. In a career spanning more than four decades, he wrote poetry, fiction, plays, lectures, book reviews, editorials, and magazine sketches in addition to fiction. As he moved from California to the eastern U.S. to Europe, he incorporated new subjects and characters into his stories, but his Gold Rush tales have been most often reprinted, adapted, and admired. "Never a tear bedims the eye that time and patience will not dry." "Never a lip is curved with pain that can’t be kissed into smiles again."